I'm a Kitchener-Waterloo based Certified Human Resources Leader in the technology industry, specialized in HR analytics and diversity programs. Learn more about me. I am a daughter, sister, friend, leader, employee, and most of all, a dreamer. I studied Psychology with a specialization in Human Resources Management and a minor in German at the University of Waterloo. Currently, I am a Certified Human Resources Leader working in the technology industry and looking for a way to ignite passion in others' lives. My goal as an HR professional is to create happier workplaces and engage employees. Most importantly, I am passionate about people, my work, and life. Start from scratch with HR. Do whatever it takes to enable others to do their best work. I get to teach kids how to code. That's pretty amazing. Most of the time, we're playing with robots. Check us out at http://www.hackademy.ca. Maintained and updated Dayforce HRIS system. Assisted in updating monthly HR analytics dashboard for senior leadership. Audited data carefully to ensure quality and accuracy. Assisted with ongoing administration and functionality of Dayforce HRIS system, including requirements gathering, basic configuration, testing, implementation, first level trouble shooting, and problem resolution. Assisted with document creation and training tools related to processes and use of the Dayforce HRIS. Served as a subject matter expert within HR as it pertains to process design. Created key HR reports using SQL. Partnered with managers in Product Development, SaaS, and IT to develop and implement recruitment strategies. Supported recruitment activities through sourcing, screening, conducting technical phone interviews, scheduling interviews, and conducting background checks. Led and participated in recruitment initiatives as required. Responsible for employee time off tracking including all leave types. Responded to inquiries/issues from candidates and users related to Taleo. Facilitated weekly conference calls with recruitment team in Asia. Supported design, configuration pre-work, and testing for Taleo 12 upgrade. Managed system access for all new hires and terminations on weekly basis. Conducted new recruiter Taleo training sessions. Supported preparation of training content, job aids, reference guides for launch of Taleo in Asia. Performed other tasks related to Taleo as assigned. Supported corporate recruiters managing paperwork for all hiring activities, preparing job postings, processing and monitoring candidate background checks through Kroll, coordinating interview logistics, and preparing offer letters / packages. Conducted phone screens as required. Conducted monthly virtual orientation sessions. Prepared and reviewed job postings for approval using Taleo, prepared employment offer letters and new hire offer packages, and validated returned new hire packages assisting 2 recruiters. Coordinated logistics for ~20 interviews on daily basis. Provided support to recruiters and organizational development team as required. Drafted weekly staffing schedules for 150-200 associates. Partnered with Hiring Managers in recruitment process, posting job postings on Kenexa, screening applicants, conducting interviews, and processing reference checks via BackCheck. Arranged training schedules and logistics for associates and managers. Provided support to HR Manager for safety- and benefits-related issues. Conducted monthly orientation sessions. Supported 2 managers, completing side projects and phone screens. Joanna has a precise mind and attention to detail. She is a unique combination of being data-driven and people-focused: she loves sourcing and interpreting minute data, but she also cares deeply for her employees and wants to do what's right for them. She is a consistent contributor and champion for office culture and wants the best for her team. Joanna is smart, driven and great to work with. Joanna has been essential to recruiting success at D2L, bringing experience, expertise and a proven ability to deliver. I have been privileged to collaborate with Joanna, benefiting from her advice, support and efforts. Joanna is an exemplary HR Professional, working to support, enable and amplify the engagement, productivity and capacity of an organization. I recommend Joanna without hesitation. Any organization would be lucky to have her. Joanna is bright, detailed oriented and technical. She is very quick at learning new systems and has strong work ethic. Her ability to trouble shoot, and think outside the box, make her a great asset. Joanna was a pleasure to work with at Manulife. I could trust her with our administrative request as she would get things done promplty, she had great attention to detail and a great sense of urgency. It was nice to be able to count on someone during our busy times! Joanna is an extremely talented employee. She always goes above and beyond what is required of her. Joanna always meets timelines (actually usually beats them) ensuring everything is done correctly and on time. She demonstrates great team work and she works with the recruiters as a partnership with a common goal of making the process successful for Hiring Managers and candidates. Joanna has a very positive impact on helping me meet my timelines and making our Hiring Managers very happy with the service (partnership) they receive from Recruitment. I truly enjoy working with Joanna. I have had the pleasure of working with Joanna as a part of the Candidate Care team, supporting Campus, at RIM. Joanna demonstrated strong technical abilities, attention to detail and drive to succeed that was an asset to the team. I wish Joanna all the best of success in her future endeavors. Cybil Lawson, National Talent Acquisition Manager at Sleeman Breweries Ltd.
Joanna is an excellent team player. We worked together as Recruitment Coordinators at RIM and it was a pleasure doing so. Joanna is someone who is always willing to help or assist others and she permeates a positive attitude. Many times I took notice of Joanna's proactive work style as well as her professional demeanor and client focus orientation. I would look forward to and enjoy any opportunity to work with her again and I believe she will have an exciting future ahead of her. Joanna and I were able to build a working relationship very quickly. She is pleasant, professional, well-organized, and demonstrates good attention to detail. When Joanna and I faced any complications or challenges she always kept a problem-solving attitude and maintained customer focus. Joanna volunteered for the Faculty of Arts on many occasions. She is very dedicated, hard-working and reliable, not to mention enthusiastic! She will make an ecellent addition to any team. 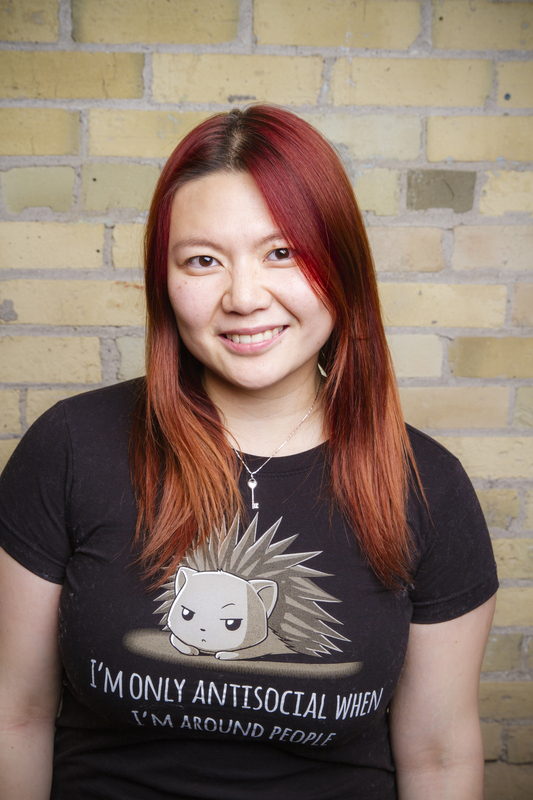 I am proud to say Joanna and I worked together in the organizing committee of TEDx Waterloo and that Joanna did an amazing job of staying on top of, and engaging the community through twitter, facebook and other social technology means. Often I would be go to respond to a question, or announce something important and would find that not only had Joanna done it already but that she had done it almost immediately. A fantastically responsive, engaging, and exciting individual I believe her efforts had a wonderfully positive impact on the success of TEDx Waterloo. I have no doubt that Joanna would be a wonderful addition to any team whether in a corporate setting, or a community one and hope to have the opportunity of working with her again in the future. I hired Joanna for a co-op placement through the University of Waterloo. She was hired to assist me (Manager, Employee Strategies) with Human Resources initiatives and programs. Examples would be researching of tri-city college and university recruiting (co-op and internship programs). She also researched advertising venues for recruitment purposes (as part of an attraction strategy). including on-line, non profit, professional websites and newspaper advertising.. She wrote summaries/documents of all her research. She developed a survey for on-line applicant tracking systems and assisted in research and documentation of the applicant tracking business case. She was reliable, and efficient, with solid communications skills and strong research capabilities. I enjoy meeting new people so I'd love to hear from you! Please feel free to get in touch with me.